It's hard to believe that we are nearing the end of our Lenten journey. It seems to have gone by so fast. That's probably because so much has already happened during these 40 days. We always say that we're supposed to slow down and simplify during Lent; and yet we've had more activity than ever this year. The Bishop's visit on March 17th (see our Facebook photo galleries here and here !) 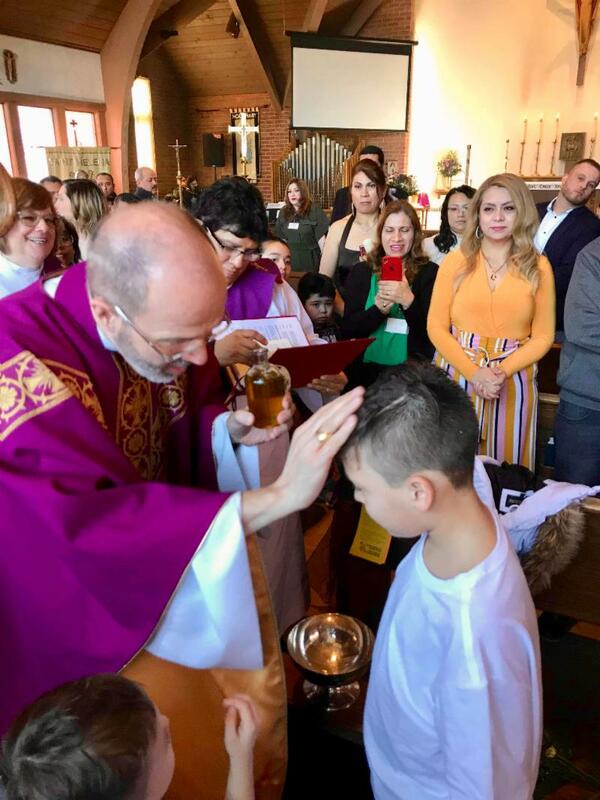 was a glorious occasion with two baptisms, the consecration of chrism, numerous confirmations and receptions into the Episcopal Church, and of course, tacos! We've taken a virtual tour of the Art Institute of Chicago's Christian art collection during adult formation. We've continued our tradition of sharing soup and salad on Wednesday nights. And yesterday, we celebrated the fiesta de quince años of Katie and Karina Jara. You're not alone if you feel it's all gone by in a blur. But the journey is far from over. On Palm Sunday, we tell two stories: the story of Jesus's triumphant entry into Jerusalem and his tragic walk to Calvary, where he is brutally crucified. These stories serve as bookends for what we call the Easter Triduum. The word, "Triduum," means three days, and it refers to the liturgies of Holy or Maundy Thursday, Good Friday, and the Great Vigil of Easter. In actuality, these are a single liturgy spread over three days, in which we hear the entire story of Jesus's Passion, death and Resurrection. On Maundy Thursday, we hear the story of the Last Supper, which encapsulates Jesus's washing of his disciples' feet, his betrayal by Judas, and the institution of the Holy Eucharist. On Good Friday, we once again proclaim the agonizing story of Jesus's journey to the Cross and his death, this time from the Gospel of John. And at the Great Vigil of Easter, we recount the story of God's salvation of humanity throughout history, beginning with the creation story in Genesis, continuing with the Exodus of the Israelites from slavery in Egypt and the witness of the prophets, and ending with the supreme act of salvation in the Resurrection of Jesus from the dead. During the Triduum, we not only hear these stories, but we participate with our hands and feet in sacred rituals that enact these stories' Lenten themes of sacrifice, surrender and salvation. We wash feet to obey Jesus's commandment (the mandatum behind the English word, Maundy) to serve each other, "do this in remembrance of me." We venerate the cross as a symbol of Jesus's sacrifice for us all. 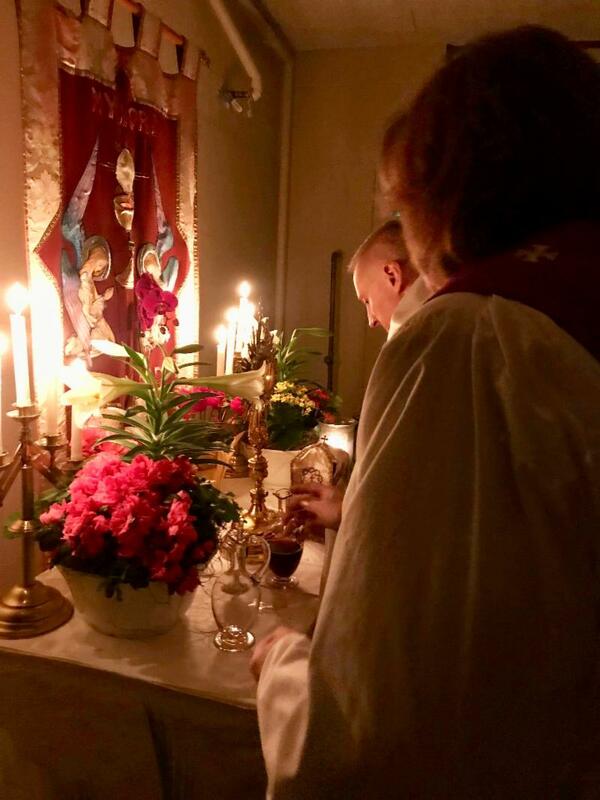 We light the new fire, sing the Exsultet, and celebrate the first Mass of Easter to signify the coming of Christ as God's light into a world that is always in danger of being conquered by the forces of darkness. Holy Week is a deep, exhausting experience, one that requires endurance. But it is transformative, too, because it calls us into greater faithfulness with the one who showed us how to live with integrity and love. It is a journey worth taking, and the only way we can endure the sore feet, the raw emotions, and the weary souls is to take it together. So, I encourage you to attend the entire Triduum. It will make the moment all the more joyous, when we say together on Saturday night and Sunday morning, Christ is Risen! 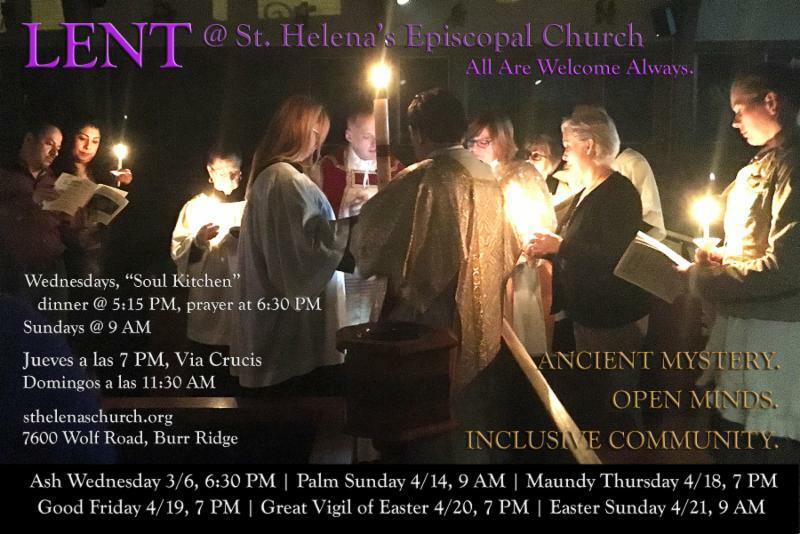 Let all your friends know about St. Helena's and invite them to join us for Holy Week. Promotional postcards are available on the entryway table (see above). 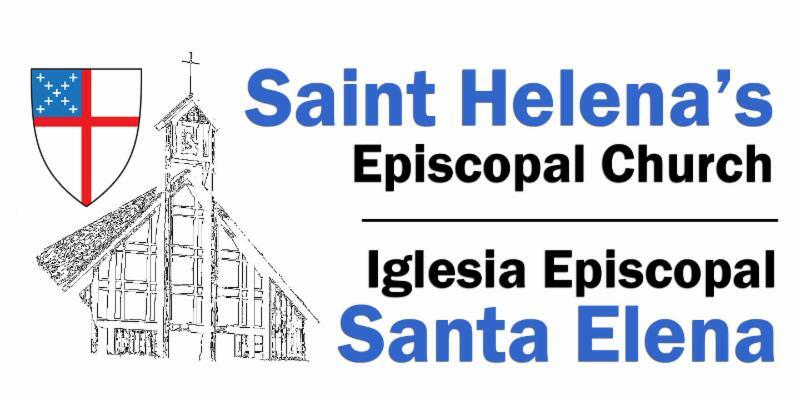 Flowers: Anyone interested in sponsoring flowers for a Sunday or feast day in memory of a loved one should sign the sign-up sheet in the narthex or speak to Jan Shangle. The charge is $50. Visite nuestro sitio web bilingüe para conocer los eventos de la parroquia y los programas para niños y adultos. 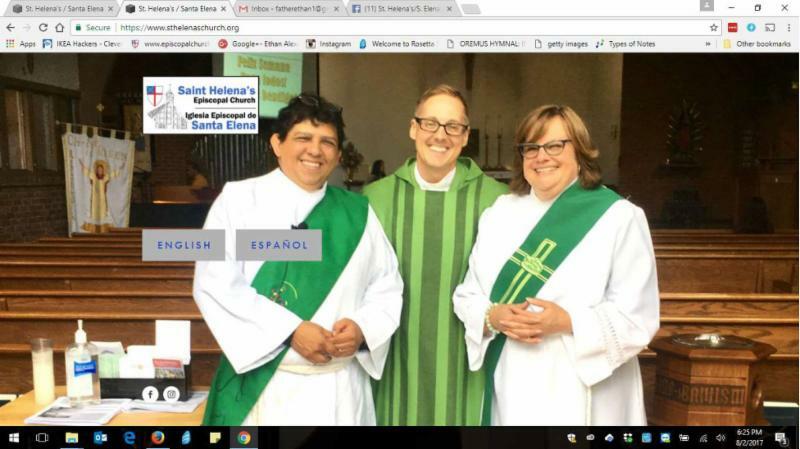 Visit our bilingual website to learn about the parish's events and the programs for children and adults.